Offer your near and dear a festive gift that tastes as good as it looks! 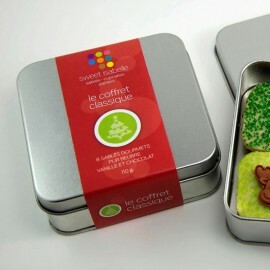 These chic metal boxes of Christmas cookies decorated with marshmallow fondant and wrapped with organza are a perfect gourment gift. 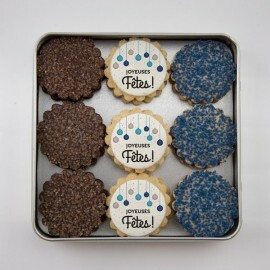 Perfect as a hostess or corporate gift. Christmas - Shortbread Boxes There are 3 products. 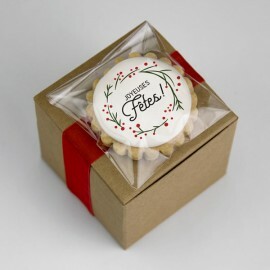 Medium box of 18 gourmet shortbread cookies (12 vanilla and 6 chocolate), 3 of which are decorated with our delicious marshmallow fondant (star and snowflakes). Available in 3 different colours : Flocon (blue), Scintillant (gold & sliver) et Classique (red & green). An ideal present for teachers, work colleagues or as a hostess or corporate gift.